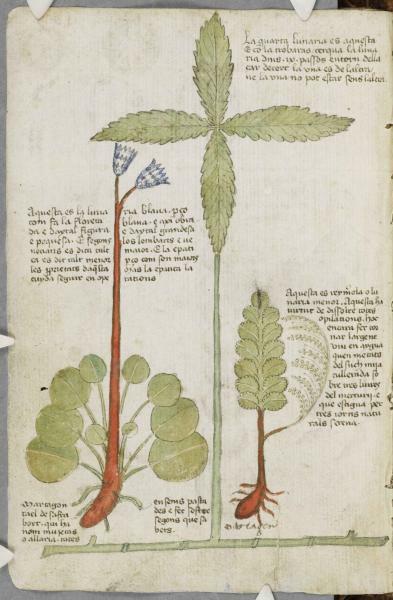 The Billingford Hutch and the Moonwort Fern – A Medieval Mystery Solved? 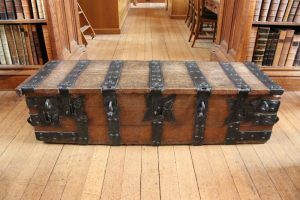 A heavy oak chest in the Parker Library (Corpus Christi College) was used to store objects left as collateral for loans of money. Its ironwork features the outline of a plant – but no-one knew why. Now a visitor to the Library may have unravelled the meaning of this decorative motif. A visitor to the Parker Library at Corpus Christi College may have solved the puzzle of a curious decorative detail on a chest dating from the early 15th century. The massive oak chest is known as the Billingford Hutch and takes its name from Richard de Billingford, the fifth Master of Corpus Christi (1398-1432). Jeremy Purseglove, environmentalist and Cambridge resident, visited the Library during Open Cambridge in September 2017. “It was a wonderful chance to get a glimpse of some of the Library’s medieval manuscripts,” he said. The chest is made from oak planks and measures approximately 1.8m x 0.5m x 0.4m. It is reinforced by numerous iron bands and five iron hasps, secured in three locks, all operated by different keys. 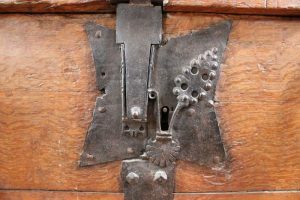 Each of the lock plates (the metal plates containing the locks, hasps and keyholes) is decorated with the outline of a plant punched into the metal. According to the renowned herbalist Nicholas Culpepper, writing in the 17th century: “Moonwort is an herb which (they say) will open locks, and unshoe such horses as tread upon it. This some laugh to scorn, and those no small fools neither; but country people, that I know, call it Unshoe the Horse.” Moonwort is also mentioned by dramatist Ben Jonson as an ingredient of witches’ broth. In both design and structure, the Billingford Hutch is similar to many surviving chests made for the storage of valuables in late medieval Europe, from strongboxes and trunks to coffers and caskets. However, what makes the Billingford Hutch remarkable is that it’s a loan chest, a rare example of late medieval ‘financial furniture’. University loan chests operated a bit like pawn shops and afforded temporary financial assistance to struggling scholars. “Richard de Billingford gave the College a sum of £20 which was placed in the chest under the guardianship of three custodians,” said Devine. Billingford created the loan fund in 1420 but the chest itself may be even older. 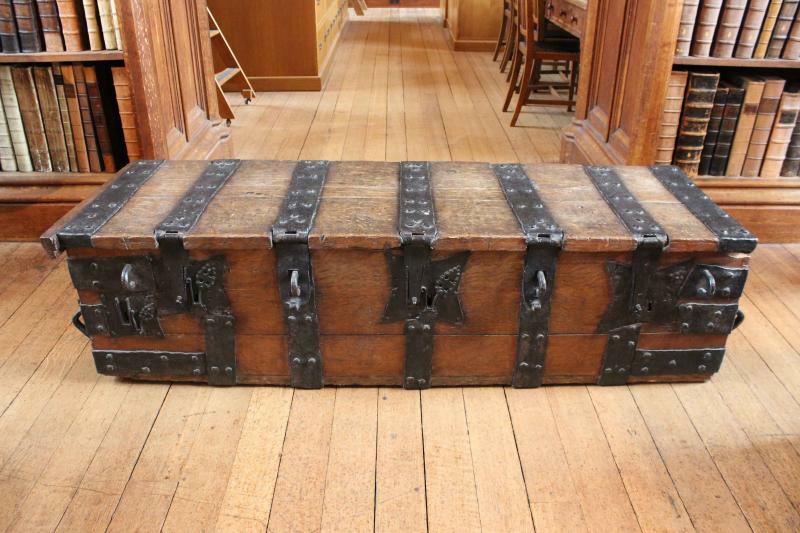 Other Cambridge colleges also had loan chests during the late Middle Ages but precious few survive. Corpus has retained not only the chest itself but also its register, containing its administrative records for more than 300 years. The register offers great insight into the role of the chest in late medieval academic life at Corpus. Every one of the College’s Fellows and its Masters is named in the register, and many were repeat borrowers, demonstrating that the chest fulfilled a genuine need. The most frequent objects pledged to the Hutch were books. Other valuables included sacred vessels and chalices, silver spoons and salt cellars. Originally published by Cambridge University under a Creative Commons Attribution 4.0 International license. This entry was posted in Art History, History, Medieval, Middle Ages. Bookmark the permalink.